One test stands between you and a place at the medical school of your dreams: the UKCAT exam. 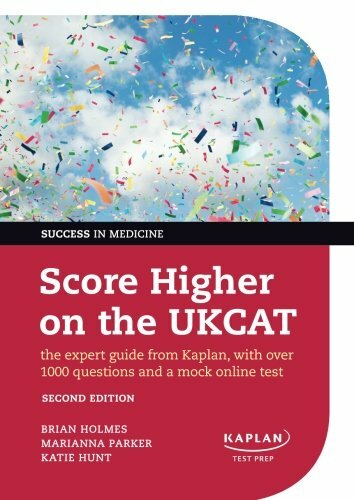 Score Higher on the UKCAT, Second Edition, offers complete expert preparation with more practice questions than any other text, invaluable tips, strategies and advice - this is all you need to succeed and enter medical school. One test stands between you and a place at the medical school of your dreams: the UKCAT exam. Unlike any other exam candidates have faced before, the UK Clinical Aptitude Test is incredibly challenging - but we are here to help with a resource to build your confidence and make sure you achieve a high score. Score Higher on the UKCAT, Second Edition, offers complete expert preparation written by teachers and doctors who have helped thousands of students to prepare for the exam. With a greater range and number of practice questions and mock tests than any other text, this book offers invaluable tips on to how interpret the questions correctly and strategies to manage your time within the exam. The authors have fully updated this book in light of developments in the exam from 2013 onwards, and this book now includes a section on a new component in the UKCAT: the Situational Judgement Test. Following an introduction to the exam itself, readers can undertake a diagnostic test at the start of the book to get a flavour for the exam and where they may need extra help. Chapters dedicated to each section of the UKCAT exam guide candidates through examples, exercises and timed practice sessions so that you can master questions in: - Verbal Reasoning - Quantitative Reasoning - Abstract Reasoning - Decision Analysis - Situational Judgement With over 800 questions and a mock online test, Score Higher on the UKCAT, second edition, is everything you need to ace the UKCAT.